Pelvic lymph node dissection is usually performed at this time, if indicated. The instruments are unchanged from the previous step; 0° lens, bipolar cautery on the left and scissors on the right. eWeck Closure Systems, Research Triangle Park, NC. fEthicon, Cincinnati, OH. FIGURE8 ■ Appearance of the prostate after the apex has been divided. Bilateral "veils of Aphrodite" (arrows) are preserved and are continuous with the puboprostatic ligaments. FIGURE9 ■ Anastomosis. 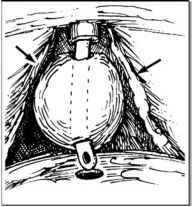 A running anastomosis is performed with the initial pass outside in on the bladder neck and then inside out on the urethra (A). The posterior portion of the anastomosis is completed in a clockwise direction (B) then the anastomosis is completed by running the other end of the suture in a counterclockwise direction and tying an intracorporeal knot (C). The technique of pelvic lymph node dissection is similar to laparoscopic pelvic lymph node dissection; however, the robotic instrumentation allows for a very precise anatomic dissection. If necessary, an extended pelvic lymph node dissection is performed in the area of the obturator fossa, the internal and external iliac vessels, as well as, removal of the node of Cloquet. 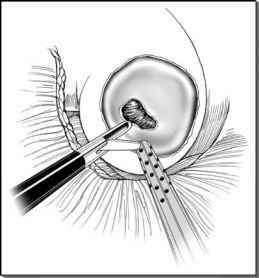 When a lymph node dissection is performed, the prostate and lymph nodes are placed in the same Endopouch Retriever.